Why the world gets dark so fast outside the circle of the campfire. We all know that the farther away we get, the dimmer a light will look. The question of how much dimmer it looks was answered a long time ago. Here’s an easy way to repeat that discovery. Use your ruler and X-Acto knife to measure and cut out a 1/2 × 1/2-inch square in the center of the index card. Clip the binder clip to the bottom of the card to make a stand. Mount the graph paper on the side of the cardboard box or piece of foamcore to make a screen. Next, unscrew the front reflector assembly of the Mini Maglite to expose the bulb. The bulb will come on and stay on when the reflector assembly is removed (see image below). Prop the light so it is at the same height as the square hole that you cut in the card. Position the card one inch in front of the light source. 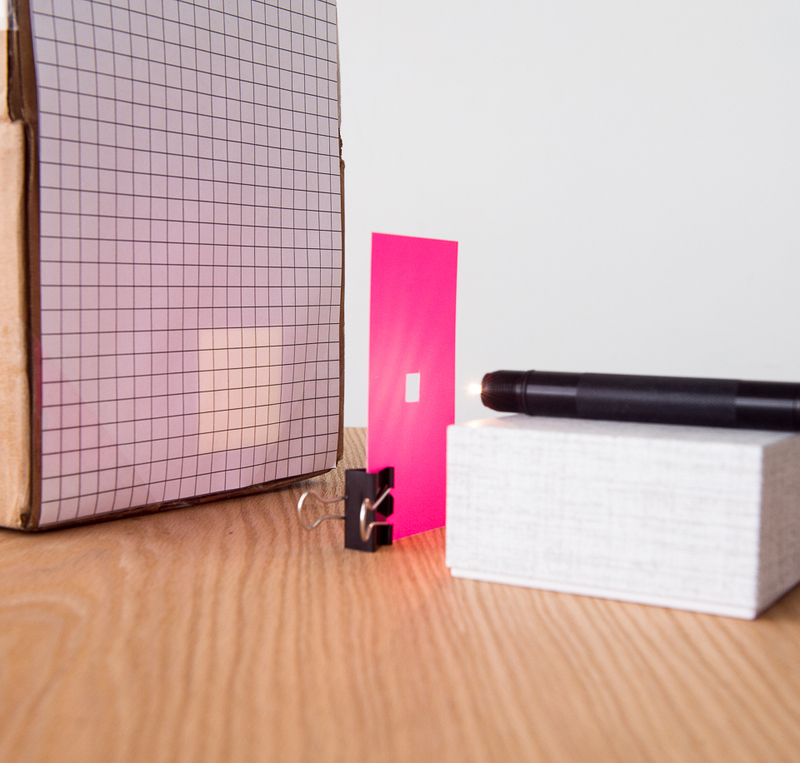 Line up the Mini Maglight, square hole, and graph paper so when the light shines through the hole you see a square of light on the graph paper. Follow the directions above, but instead of a 1/2 x 1/2-inch hole, cut out a 1 x 1-cm square hole in the center of the index card. Position the card 2 centimeters in front of the light source. Use graph paper with 1-cm squares printed on it. 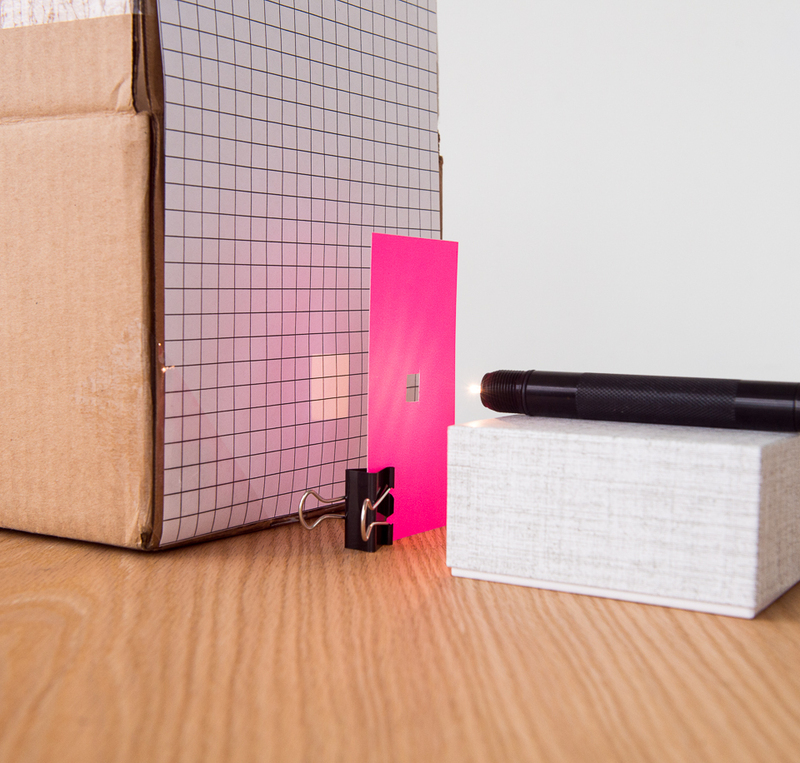 Keep the distance between the bulb and the card with the square hole constant at one inch. (If you are using metric graph paper, we recommend a distance of 2 cm.) Put the graph paper at different distances from the bulb, and count how many squares on the graph paper are lit at each distance (click to enlarge diagram below). The results will be easier to understand if you make a table of “number of squares lit” versus “distance.” Be sure to measure the distance from the graph paper to the bulb each time. The intensity of light is the power per area. Since the energy that comes through the hole you cut is spread out over a larger area, the intensity of the light decreases. Since the area increases as the square of the distance, the intensity of the light must decrease as the inverse square of the distance. Thus, intensity follows the inverse-square law. The inverse-square law applies not only to the intensity of light but also to gravitational and electrical forces. The pull of the earth’s gravity drops off at 1/r2, where r is the distance from the center of the earth. The attraction or repulsion between two electric charges also decreases with the distance at 1/r2, where r is the distance between the two charges. Compare the brightness of two light sources with an oil spot on a white card. Light gets dimmer the farther it travels–and a bit of simple math explains how.